***********A WONDERFUL OPPORTUNITY TO ENJOY AN OCEANFRONT VACATION ON HANALEI BAY AT A DISCOUNTED RATE. BOOK ONLINE NOW and take advantage of this limited time offer. Seasonal rates now through 4/31 normally 10500/week (high season). BIG SAVINGS! This is a county approved Vacation Rental (TVNC 1322) HI Tax ID TA-090-147-6352-01 24/7 on-island contact Talia Abubo. Over the years we've accommodated happy guests from all over the world. They return year after year. Centralized along beautiful Hanalei Bay, enjoy Pine Tree Villa a beautiful custom built 2-story oceanfront home, featuring 3 bedrooms/3 baths + powder room. Exotic Brazilian cherry wood floors, granite counter tops, and marble stone touches compliment this wonderful vacation home. Here you will discover panoramic turquoise-blue ocean views, colorful sunsets, and majestic waterfall mountains. On the second level you will find the grand master bedroom and bath, kitchen, living, dining, and powder room. The master bedroom is equipped with a King bed and a luxurious bathroom, including a walk in shower for 2, his and her vanity, and jetted soaking tub. Just off the dining area is a large covered lanai, providing ample space for relaxation. There are 2 bedrooms located downstairs. Bedroom #2 includes a King bed and private bath. Bedroom #3 includes a queen bed, that has access to a bathroom that can be made private or shared. Garden views are present from the bedrooms. Pine Tree Villa is the perfect place for those seeking a beachfront vacation in one of the most amazing places in the world....Hanalei Bay! The villa is well loved and maintained. It is a home away from home in 'paradise'. The villa comes equipped with quality linens, large LCD flat panel televisions, DVD, DVR box to record your favorite movies, Bluray, collection of dvd movies, bluetooth speaker, wireless Internet access, fun board games for kids and adults, propane bbq, nice kitchen appliances, light weight Hotel collection waffle robes, lots of beach gear, 4 soft top surf boards, and so much more.....all available for pure enjoyment. Added conveniences include the villas custom built outdoor shower..perfect for after beach visits, iron, hair dryers, phone in every bedroom, and a start up supply of bath and body products. Located along the Pine Trees beach stretch, the heartbeat of Hanalei Bay, this local beach access spot puts you in the middle of everything! This beach access have cars in front of the house during the day, it's a sandy lot, lined or lit with the number of vehicles dependent on the surf -- most all of them leave before sunset. You will also find the tip of Puff the Magic Dragon's famous nose across the beautiful bay to the historic, picturesque Hanalei Pier. Watch whales and world-class surfers from the wrap around lanai all winter, enjoy beautiful sailboats, and sunbathers all summer. People watching is a favorite pastime. Sunsets are magical. Trade winds are pleasant. Rainbows and waterfalls are yours to be experienced. Hanalei is everything that you have read and/or imagined! Hanalei 'town' is only a minutes walk away. This beachfront home is even better in person than the pictures can show. Can you imagine . . .
Sleeps 8 max. 2 kings, 1 queen, and sofa pull out bed located downstairs TV area. Sofa bed comfortable to accommodate 1 adult or 2 small children. Non-smoking. **Cancellation Policy: Reservations cancelled outside of 90 days prior to arrival subject to $750 cancel fee. All cancellations received within 90 days prior to arrival is non-refundable. Seasonal rate structure: Holiday Season Thanks Giving Week, X-Mas, and New Year (12/15 - 1/10) require a 7 night minimum rate, if covering only 1 holiday. Otherwise a 2 week minimum is required. High Season (3/15 - 4/30 & 6/1 - 9/5) 5 night minimum. Low Season requires a 3 night minimum stay. We will honor less than the minimum night stay requirement if the booking dates fit between reservations. Please inquire. Born and raised on Kauai. Excited to share with you my homegrown knowledge, and all the fun things Kauai has to offer. Specializing in Kauai vacation rentals and personalized concierge services. Pine Tree Villa offers all visitors the perfect opportunity to explore Kauai's magical north shore. Beautiful panoramic ocean views are present from the upstairs living area. This home is well loved and respected by many. This is a wonderful home for all. Everyone loves the Pine Tree Villa. It is conveniently located for quick beach visits, and a great way to enjoy everything the north shore has to offer. Amazing adventures begin here. Only a short walk to town and all the shops of Hanalei. 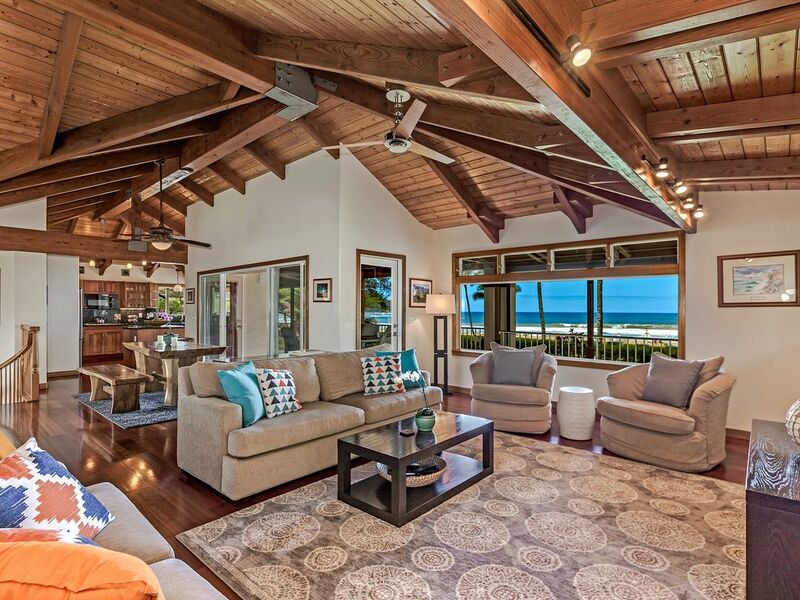 The 2-level home offers wonderful ocean views from the upstairs living area. Enjoy the covered decks, and relax to breath taking ocean views. Watch the surf roll in and hear the relaxing sound of the waves. Beautifully furnished, with clean hardwood floors, and marble touches add a tasteful and luxurious feel to your stay. The large glass windows allows for a great indoor/outdoor vibe. Special touches through out the home. The custom outside shower has hot/cold water is perfect to come home to after beach visits and hiking. toilet, combination tub/shower, 2 person vanity sink w/ tub shower. toilet, shower, Option to close off the bathroom for privacy, or leave open. 3 full baths and a half bathroom off the kitchen. Panoramic views from the upper level only. The villa is located on beachfront property. A public parking lot sits between the villa and the beach itself. It gets busy when the surf is good, and most leave before sunset. Panoramic ocean views present from the upper floor. all local on island calls are free of charge. Whirlphool HE front load washer. Please park in front of the garage. No more than 2 cars allowed on property. Living room provides ample seating. Sofa couch, love seat, and 2 single swivel chairs. The kitchen is well equipped with major appliances, as well as blender, coffee maker, microwave oven, and toaster. Hard wood dining table in the home can sit up to 8. There is also dining for six on the lanai, with extra chairs. There is a tv in living room, master bedroom upstairs, and tv area downstairs. Please do not change the settings on the televisions. Refer to the house manual for instructions, or call manager. The living room cable offer a DVR recorder. Please be sure to delete your recordings before check out. Small collection of DVD's available. Cancel Policy: Notice of cancellation MUST BE IN WRITING AND RECEIVED MORE THAN 90 DAYS PRIOR TO YOUR CHECK IN DATE. We will refund the sums you have paid, less a $750 cancellation fee. If your notice of cancellation is RECEIVED 90 DAYS OR LESS PRIOR TO YOUR CHECK IN DATE, you will forfeit all sums paid in advance. Once funding occurs, dates are blocked off. This home is offered by owners agent. Therefore you may find our home on other websites. If you book thru outside agent additional terms and fees may apply. In order to maintain a safe and secure booking process we ask that you contact, before sending money to confirm your reservation. Once your reservation is fully funded you will receive final instructions, to include driving direction, and more. If you don't not receive these items 30 days prior to arrival please contact us. Island properties require special upkeep, due to environmental conditions. We continue ongoing maintenance between reservations, to maintain premium conditions for your safety and use. A signed rental agreement and payment is required to confirm reservations. Please refer to your vacation rental agreement and policies. We DO NOT accept over payments, post dated checks, and foreign checks. Full payment is due within 90 days of arrival. HOLIDAY SEASON POLICY: Christmas/New Year Booking require a 7-night minimum rate if covering only 1 holiday. 2-week minimum if covering both holidays (X-Mas & New Year). We usually accept bookings within 1 year in advance. Tax rate is 14.96%. High Season (3/15 - 4/30 & 6/1 - 9/5) 1 week minimum rate. Low Season 4 night minimum stay. If available dates are less than the minimum night stay requirement, we will honor bookings that will fill the gap between reservations. Mid stay cleaning required.